A commercial air co nditioning system has to do much more than a simple residential system does. And when trouble comes, it rarely comes at a good time. A reliable professional air conditioning service is vital during such times, especially in the summer when our weather becomes so hot. 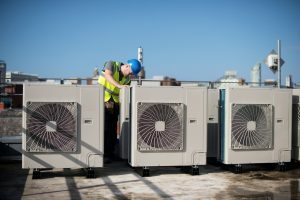 Not only must your service understand the specifics of commercial air conditioning, but they need to move very quickly in order to do the job. While a residence may be able to sit tight for a day or two and wait for repairs, commercial systems have no such luxury. Be sure to bookmark the Murphy’s Plumbing, Heating & Air Conditioning blog for updates on the latest advances in plumbing technology. Call Murphy’s Plumbing, Heating & Air Conditioning for all your plumbing, water heaters, drain and sewer, HVAC services, and commercial needs.